Last week I was sifting through old photos of people drinking beer in Oshkosh saloons. In two of the pictures, something jumped out at me. See if you can guess what grabbed my attention. I’ll narrow it down: it’s not the mugs of dark beer or the kids hanging out at the bar. Here’s the first photo. It’s from 1903. This is a look inside the Wenzl Miller Saloon. That’s Wenzl Miller behind the bar. Miller’s stand was as rudimentary as a saloon could get. It was located at the north west corner of 6th and Ohio streets, at what is now 600 W. Sixth Ave.
A few words about Mr. Miller. He was born in Austria in 1845. Wenzl left his homeland for America when he was about 25 years old. He worked in lumber mills here before launching his saloon. He also ran the Sixth Ward Meat Market at what is now 601 W. Sixth Ave. The butcher shop was just across the street from the saloon. He and his wife Caroline had 14 children. Wenzl Miller died in 1932. He was 86 years old. Up next is a place I wish I knew more about. It would be nice to know anything about it. Looks like it could be an Oshkosh saloon. 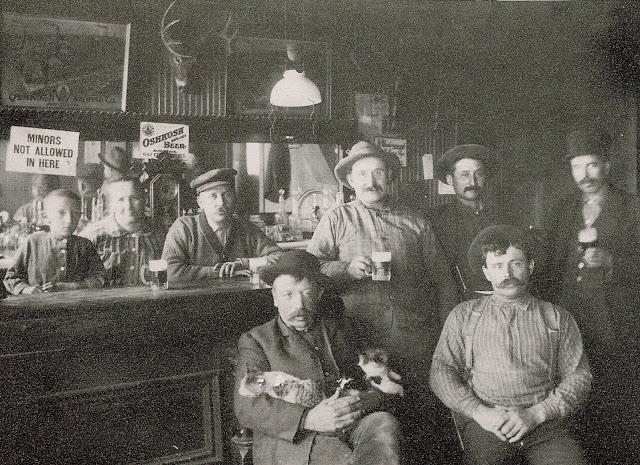 Judging by the paraphernalia, clothes and dark beer, I’m guessing this was taken sometime in the early 1900s. I love that picture. The guy with the cats in his lap. The kid standing directly under the sign “MINORS NOT ALLOWED IN HERE.” Wonderful. Have you guessed the common theme? It was hanging behind the bar in both saloons. Here it is in luscious, living color. 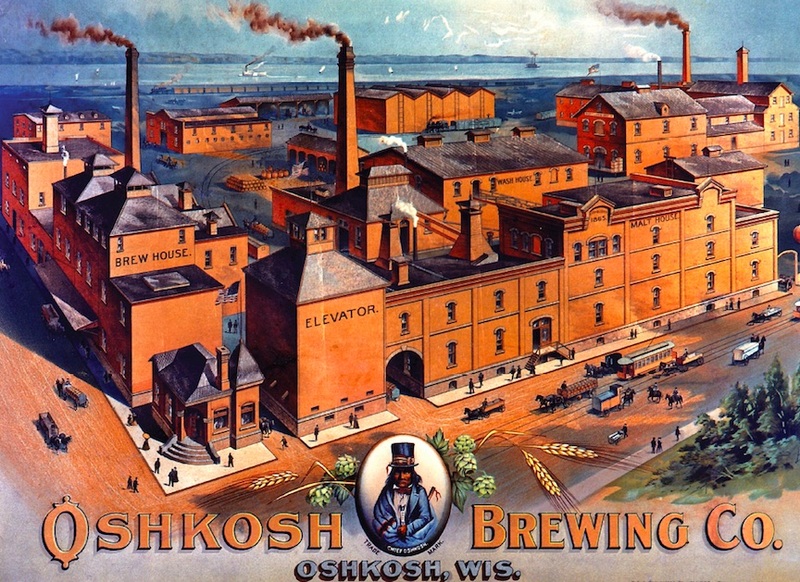 This lithograph of the Oshkosh Brewing Company was produced near the turn of the century. There’s a bit of exaggeration going on here. OBC looked nothing like what you see in the print. It’s a composite image. It shows three separate OBC facilities. Each was in a different part of town. Mashing them together made for a more impressive effect. Brewers used to do this kind of thing in their advertising all the time. Look at those saloon photos again. Compared to the lithograph, with its luminous color, the saloon scenes look so old. It’s the limitations of early photography that makes it so. Those places were vibrant, brimming with life. If we could see the colors our view of the past would be different. The distance between now and then wouldn’t seem so great. We have much in common with these people. Whether you call it craft beer, microbrew, speciality beer, or what have you, beers of distinction have had a home in Oshkosh for more than 150 years. 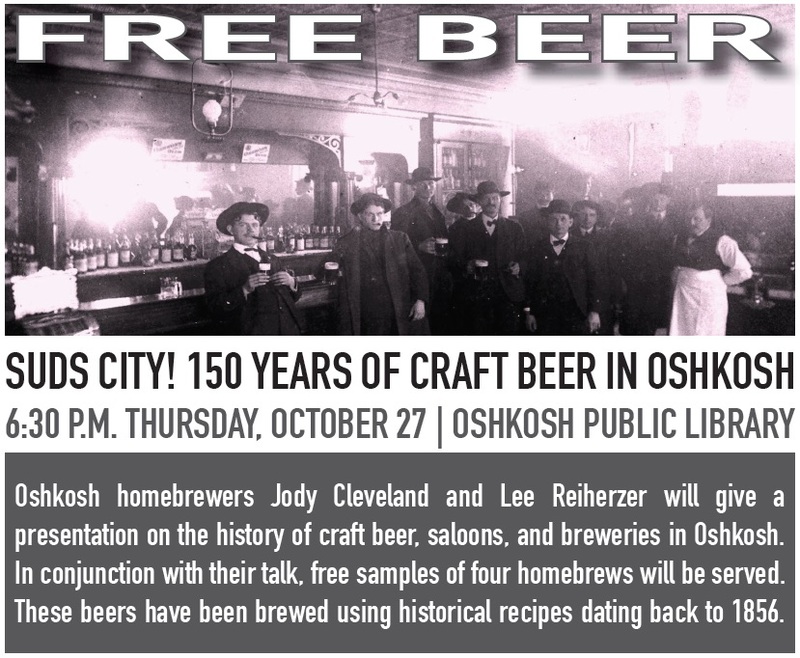 Jody Cleveland and I are going to explore the history of these unique beers on Thursday, October 27, at 6:30 pm at the Oshkosh Public Library. Admission is free and so is the beer we’ll serve in conjunction with our talk. It’s the beer I want to get into here. We’ll serve samples of four beers Thursday night. The beers have been brewed from recipes based on research into the periods when these beers were originally brewed and drank in Oshkosh. Here’s a quick rundown of the beers we’ll be pouring. This was produced in 1858 by Oshkosh’s Busch Brewery, forerunner to The Fifth Ward Brewery. As the date would suggest, this will be the most rustic of the beers we’ll have on tap. It’s a full-bodied, deep-amber lager with a noticeable hop bitterness. By the way, the hops used in this beer are descendents of hops grown in Winnebago County in the 1850s. This beer truly is a time capsule in a glass. This one is based on an 1875 beer brewed by Lorenz Kuenzl at the Gambrinus Brewery in Oshkosh. It’s a dark lager of the sort that was once exceedingly popular here. An all-malt beer in 1875, Kulmbacher was a favorite of Oshkosh’s German immigrants who brought a thirst for the beers of their homeland to their new home in the new world. Oshkosh brewers didn’t dabble much in ale, but here’s an exception. Peoples began brewing Old Derby Ale in 1937. The original iteration was an American interpretation of an English stock ale. This is a medium bodied ale with a pronounced hop flavor supplied by cluster hops. This beer marks the beginning years of the specialty beer revival in Oshkosh. Produced by the Mid-Coast Brewing Company of Oshkosh and brewed at the Stevens Point Brewery, this first appeared in Oshkosh in 1991. It’s an all-malt amber lager akin to a Vienna lager. This was the first American “Red Lager” and the first craft beer to be canned. There you have it. Hope to see you Thursday and share some beers with you. Prost! If William Glatz wasn’t dead, he’d have been livid. Glatz was president of Oshkosh Brewing Company from 1904 until his death in 1928. He presided over the brewery as it came to utterly dominate the Oshkosh beer market. The picture that ran in the Oshkosh Daily Northwestern on November 5, 1971 epitomized everything William Glatz dreaded. The great brewery his father helped launch had been overtaken by the upstarts. On Monday, October 18, 1971, the last bottles of Chief Oshkosh beer brewed by OBC came off the bottling line. The following day rumors began circulating that the brewery was closing. At OBC they would neither confirm nor deny the rampant speculation. Mack knew exactly what was “doing over there.” He had the inside track on OBC’s impending closure. 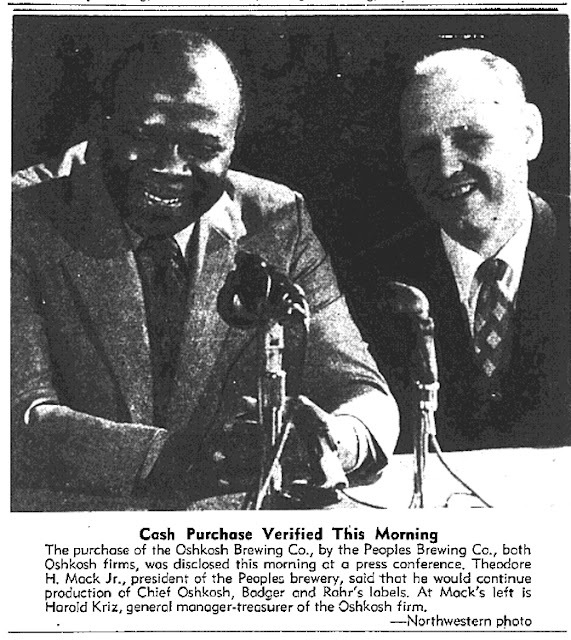 Mack had already negotiated the purchase of OBC’s Chief Oshkosh, Rahr’s, and Badger Brew brands. By the end of November, Peoples’ version of Chief Oshkosh Beer was in production. Peoples’ brewmaster Howard Ruff said he’d do his best to clone the OBC brew. "Each beer has its character and all beer is a little different, but we will try to match as closely as possible the beers that were produced by the other firm before the purchase," he said. That bit of news may not have elicited the intended response. 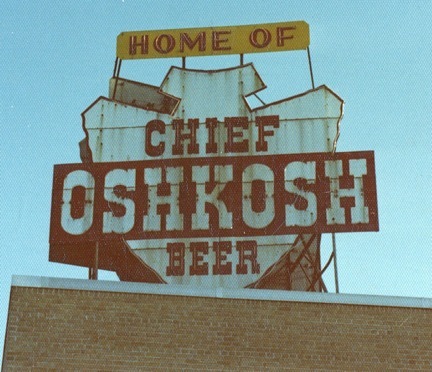 By 1971 the reputation of Chief Oshkosh Beer was thoroughly tarnished. That didn’t matter. Peoples forged ahead. At the close of 1971, the first ads began to appear for Chief Oshkosh Beer made by Peoples Brewing. The can in the ads still bore the imprint of Oshkosh Brewing Company. Here’s William Glatz’s nightmare in living color. 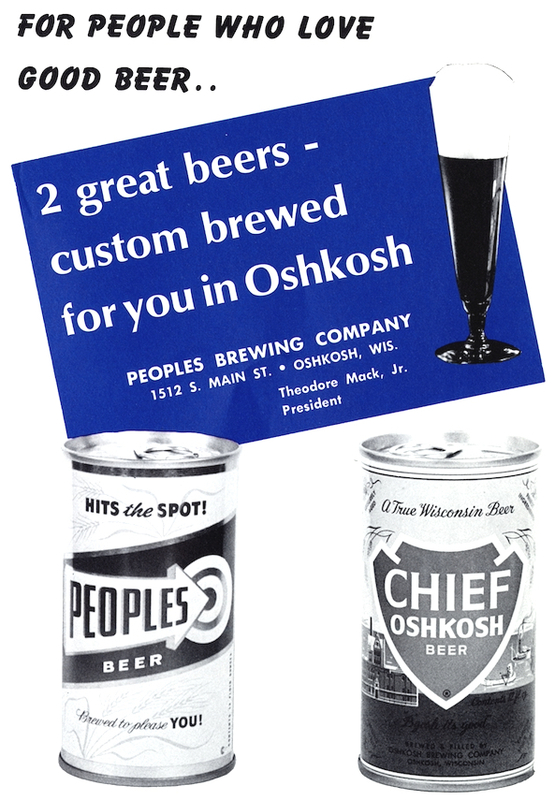 A can of Chief Oshkosh “Brewed & Filled” by Peoples. Glatz’s nightmare passed quickly. Less than a year after acquisition of the Chief Oshkosh brand, Peoples Brewing collapsed under the burden of its debt load. 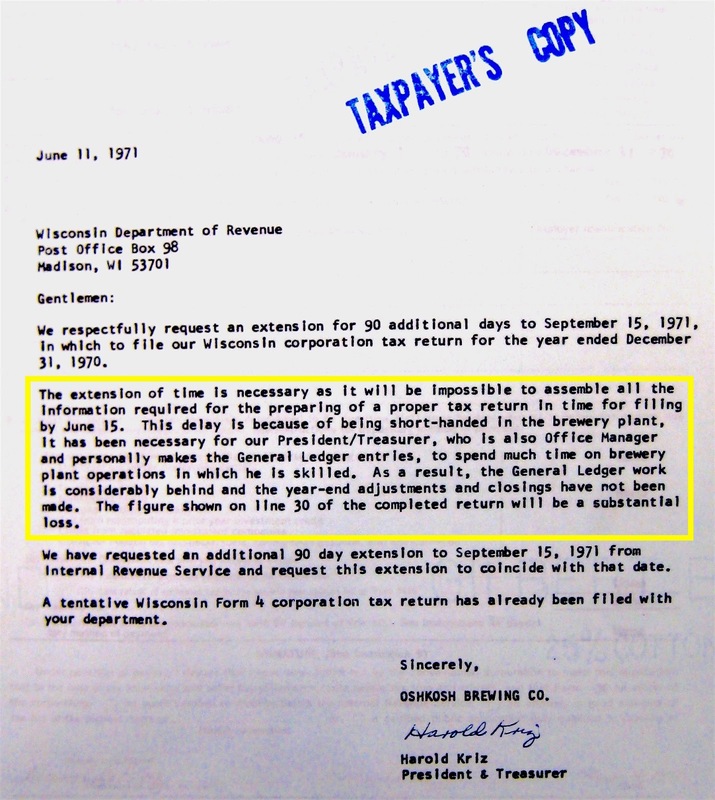 By October 1972 rumors were swirling in Oshkosh of Peoples’ imminent demise. When asked if the rumors were true, Mack would neither confirm nor deny. He’d go on being evasive. It didn’t matter. The question was answered soon enough. On November 3, 1972 production employees at Peoples Brewing were permanently laid off. The beer in holding tanks waiting to be packaged was dumped. It was over. Chief Oshkosh was gone for good. If you have the slightest interest in good beer you’ve no doubt heard the racket about the looming craft beer bubble. The implication being that craft beer production has outpaced demand. That a day of reckoning will soon be at hand. I don’t buy it. Often cited in these stories is the sharp increase in new breweries. There are now more than 4,600 breweries in America. You’ll see that factoid coupled with the recent slowdown in retail sales for established brands. The two occurrences do correlate. But not in the way that most reports on the craft beer bubble suggest. It’s not as though people are abandoning national brands like Fat Tire and going back to Miller Lite. They’re abandoning Fat Tire for beers brewed in their own region. Much of the decline in sales of established craft brands is directly attributable to the success of newer, smaller breweries serving local markets. Dip down below the five largest craft breweries and you’ll see that growth continues to be significant – in the area of 16%. Craft beer drinkers are steadily moving away from national brands in favor of local beer. In fact, they’re going directly to the source. According to the Brewer’s Association, about 7% of craft beer sales now occur on-premise in brewery taprooms. Growth in this sector is estimated to be near 20%. That’s a phenomenal figure. So what does this mean for us in Oshkosh? First of all, it indicates that opportunities remain ripe for breweries in this area. The shift is clearly towards local beer. That bodes well for Oshkosh’s two breweries and ought to be encouraging for the three breweries currently in the planning stage. The flip side is that brewery taprooms sometimes have an adverse effect on beer sales in bars. 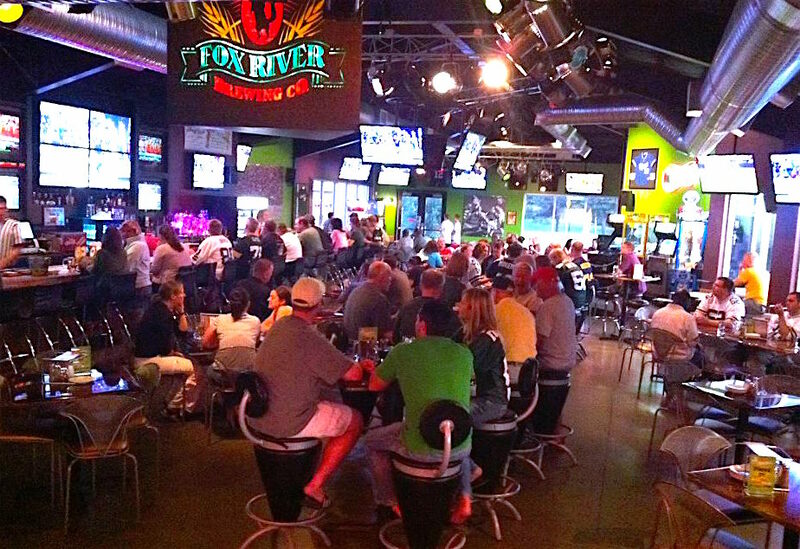 Craft beer on draft in Oshkosh has always been strongly associated with the bar scene here. That could shift if we have more breweries in Oshkosh selling beer from their own taprooms. There’s awareness of this within the industry. The Tavern League of Wisconsin has already has shown its willingness to fight the growth of brewery taprooms. But that’s yet another fight the Tavern League will likely lose. If there is a craft bubble, its impact will most likely be noticed on the retail side. The vast majority of packaged beer sales in Oshkosh occur in grocery stores and gas stations. These are places where distributors have a heavy hand in deciding what beer goes on the shelves. That’s a situation that almost always favors larger breweries. I’ve talked with plenty of distributors over the last few years. They rarely show enthusiasm for dealing with portfolios that include dozens of brands from small breweries they know little about. That’s not good for any small brewery hoping to make headway selling packaged beer. It’s not good for consumers, either. Our local grocery stores have the resources but lack the aptitude to curate anything other than a mediocre beer selection. And their reliance on distributors virtually ensures no improvement on that front. If you’re into good beer, that makes it all the more important to support places like Gardina’s and Ski’s where people who work in those stores are deeply involved with what goes on their shelves. One last thing, I can’t help but think about all of this within the context of Oshkosh’s beer history. If in the next couple years we find brewery taprooms growing in prominence, it will truly be a return to form. Our earliest breweries all operated on a taproom model. Bare Bones, not being a brewpub, has the most direct connection to that lineage. Judging by the brewery’s production numbers it appears Oshkosh is more than willing to support such endeavors once again. Things here are changing. It’s not a bubble. It’s another beginning. By 1969, the Oshkosh Brewing Company had been decimated. Under the management of David Uihlein, OBC was transformed from a highly regarded regional brewery, to one trapped in a downward spiral. Production decreased 30% in the eight years Uihlein owned the brewery. The reputation of its flagship brand, Chief Oshkosh Beer, had been destroyed. David Uihlein’s work here was done. 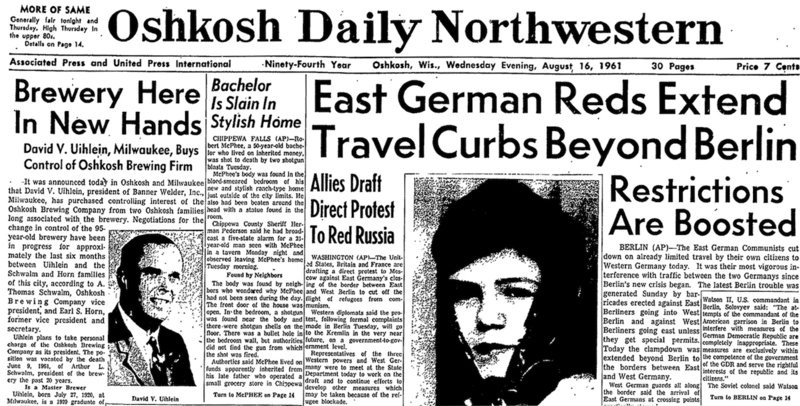 On Monday, June 30, 1969, the Oshkosh Daily Northwestern ran a brief story on page six explaining that OBC was being sold. Uihlein had agreed to sell his majority stake to a coalition of Oshkosh residents doing business as Hometown Brewery, Inc. Terms of the sale were not disclosed. The brewery’s new president would be Harold Kriz. He had been with OBC since 1952. Kriz had worked his way up through the ranks. He was the brewery’s general manager at the time of the sale. The new OBC board of directors included Kriz and three other long-time OBC employees: Roger Zillges, Audrey Ackerman and William Cowap. Oshkosh attorney Robert R. Thompson rounded out the five-member board. Considering their level of experience, the new directors had to have realized what they were up against. In 1969, there were just 15 breweries operating in Wisconsin. Ten years earlier, the state had been home to 32 functioning breweries. The downward drift didn’t bode well for Harold Kriz and the new management at OBC. There were small breweries in Wisconsin, though, bucking the trend. The Stevens Point Brewery and Chippewa Falls’ Leinenkugel’s Brewing were comparable in size to OBC. Both were successfully managing the downturn by maintaining a focus on their local market. Uihlein hadn’t cared for that approach. His goal had been to expand the brewery’s distribution footprint. The strategy failed to yield dividends. And in the meantime, OBC’s share of the Oshkosh market shrank. 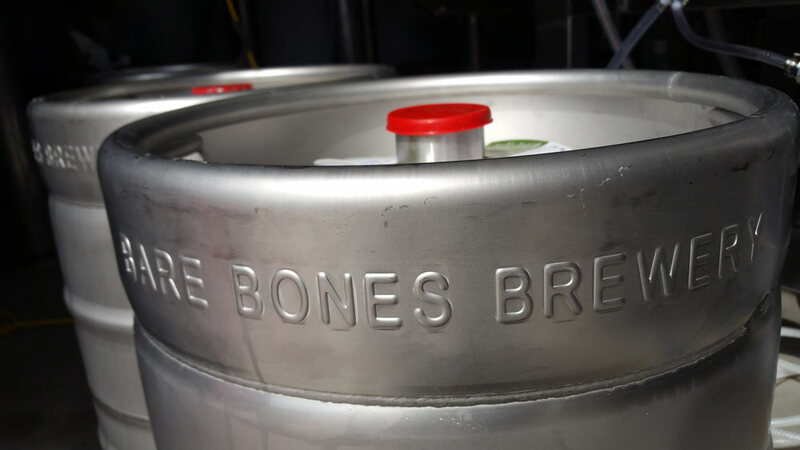 As the name implied, Hometown Brewery, Inc. intended to reverse the local slide. But there was an essential piece of the strategy that had gone missing. Leinenkugel’s and Point held their local markets by producing quality beer. OBC was no longer in the habit of doing that. Chief Oshkosh Beer had degraded into a compromised brew made from the cheapest ingredients. The decline in quality was a fairly recent development. It was a beer once lauded by industry experts. When the J.E. Siebel Sons’ Company (forerunner to today’s Siebel Institute) examined Chief Oshkosh in February 1960, its offered a glowing review. The sample submitted can be judged most favorably in every respect. It is a chemically and physically sound product… The product pours with a creamy stable foam showing attractive volume and texture… Further observed is the brilliant clarity of the beer… We are most impressed with the fine organoleptic properties. The beer is clean, smooth on the palate, fairly aromatic with a bare touch of wininess, yet mild, as well as pleasingly hopped. In particular, it is the fresh and unoxidized character which is welcome to the critical taster… The sample was given a very good rating in blindfold taste trials. I should state that I have never encountered a beer without some redeeming social value, save two appalling Wisconsin concoctions, Chief Oshkosh and Oconto… Gad what sewage! - R. Emmett Tyrell Jr., Lakeland Ledger, October 22, 1976. Harsh. But not surprising when you appraise what was going into the beer. Over the course of the 1960s, the mixture of adjuncts that found their way into Chief Oshkosh Beer included soy flakes, corn syrup and hop extracts. A 1971 brewer’s log offers a glimpse under the hood of Chief Oshkosh Beer. The second ingredient, listed as Nu-Bru on this sheet, was a corn syrup. OBC bought tanker loads of it. This was not a beer that would win back people who knew Chief Oshkosh in its prime. If Kriz and the crew at Hometown Brewery had hopes of reviving past glories their expectations had to have been short lived. By the end of 1969, the reality of their situation was inescapable. OBC was in free fall. Production for the year fell to just 33,613 barrels. It was the brewery’s lowest output since 1940. The cratering gathered momentum. As OBC’s sales declined, cash flow diminished. Limited funds made it impossible to improve the beer’s quality. The only avenue left to pursue was discount pricing. 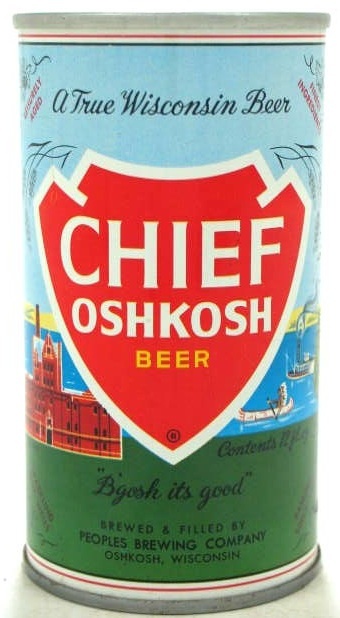 By 1970, Chief Oshkosh had become one of the cheapest beers sold in Wisconsin. The low price a testament to its repute. In 1971, the fiasco ground to a halt. The brewery stumbled through the first half of the year. The brewhouse often sat idle. When William Cowap died in January, his spot on the board of directors was left vacant. Manned with a skeleton crew, basic operations within the brewery went untended. A letter from Robert Kriz to the IRS dated June 11, 1971 details a brewery on the verge of collapse. The second paragraph tells the story. Four months later it ended. Rumors that the brewery would close were reported by the Oshkosh Daily Northwestern on October 20, 1971. When asked if the rumors were true, brewery spokesperson Audrey Ackerman responded, "We haven't decided yet." Actually, the fate of OBC had been decided for some time. The last batch of Chief Oshkosh Beer produced at the Doty Street brewery was brewed on September 9, 1971. The following month, the Oshkosh Brewing Company made the announcement everyone knew was coming: it was closing. The Hometown Brewery had come to its end. Ruby Owl Tap Room Beer + Doughnuts Pairing – Thursday, October 13 from 3-10 p.m.
Doughnuts from Tamara the Cake Guru meets beer from the Ruby. 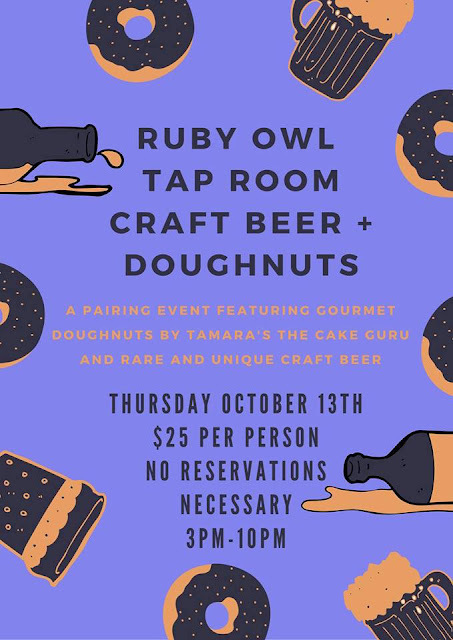 They haven't mentioned what sorta beer, only that it’ll be, “some very unique and sought-after craft beers.” $25 per person and they’re suggesting you come early. They’ll have a limited number of pairings and expect to sell out. Flight School with Lance at O’Marro’s Public House, Thursday, October 13, 8 p.m.- 2 a.m.
Each Thursday beer savant Lance Lehman guides you through a flight of five beers, explaining what they offer and what they’re all about. Good deal on this one, it adds up to 28 ounces of beer for only $5. Check it out, here’s a link to the event page. Barley's Beer Sampling, Saturday, October 15th at 6 p.m. The first installment of this season’s Barley & Hops Beer Sampling Series kicks off this Saturday. This is a full-on beer sampling with tickets going for just $20, if you grab them in advance. $30 if you wait to buy them at the door. Featured brewery this time around will be Madison’s Karben4. These are always a blast. For more, here’s a link to the event page. 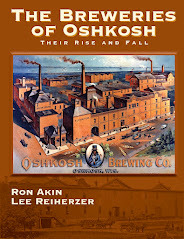 Sud's City: A History of Craft Beer in Oshkosh, Oshkosh Public Library, October 27, 6:30 p.m.
David Uihlein was probably glad to see Shorty Kuenzl go. The 63-year-old treasurer of the Oshkosh Brewing Company was too tied-up with the past. Kuenzl was the last remaining member of the OBC board of directors whose family history traced back to 1894 and the origin of the brewery. Uihlein, who purchased controlling interest of OBC in 1961, represented a break with the past. And he was intent on recasting the brewery in a mold of his own making. When Shorty Kuenzl retired in 1963, the lineage he embodied came to an end. There could be no mistaking that this was now David Uihlein’s brewery. What Uihlein didn’t realize was that losing Shorty Kuenzl would help bring on the demise of OBC. Soon after retiring from the brewery in the spring of 1963, Shorty reappeared as a competitor. He had no intention of calling it quits. Beer was his life. 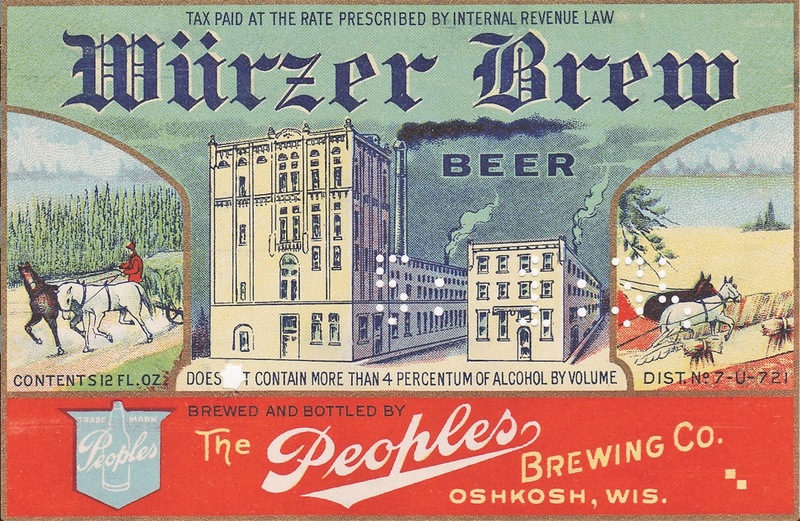 Shorty Kuenzl’s grandfather, Lorenz Kuenzl, had helped launch the Oshkosh Brewing Company. Shorty went to work at OBC at the close of Prohibition in 1933. He became the brewery’s treasurer in 1940. He also worked as sales manager. Shorty helped set the course for OBC as the brewery attained its peak in the late 1950s. It was a family business. He was knit to it. The association began to unravel in 1961. Early that year, the Horn and Schwalm families, who together held controlling interest in the brewery, began privately negotiating the sale of their shares to David Uihlein. At the time, Shorty Kuenzl owned approximately 14% of OBC’s issued stock. But with nearly 52% of OBC stock held by the Horn and Schwalm families, there was nothing he could do to prevent the sale. 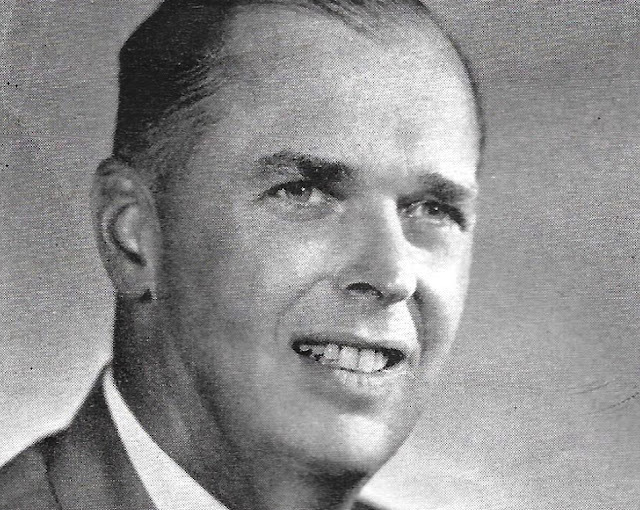 On August 16, 1961 David Uihlein announced that he had purchased controlling interest of OBC. Uihlein appointed himself the brewery’s president. Shorty Kuenzl remained as treasurer at OBC. That wouldn’t last. Relations between he and Uihlein were strained. Shorty retired from the brewery two years after the sale. Uihlein replaced him with a former race-car driver named Carl Marchese. He was an Uihlein cronie with no experience in the beer business. Unwittingly, Uihlein was setting the stage for his own undoing. Shorty Kuenzl didn’t waste much time in exacting a toll on his former boss. Almost immediately upon leaving OBC, he purchased Lee Beverage, a beer distributorship based in Oshkosh. Lee Beverage, had previously posed little threat to OBC. Its primary brands – Old Style and Pabst – were sold as premium beers. A case of either of those beers usually sold for about a dollar more than a case of Chief Oshkosh Beer. Shorty Kuenzl would change the direction of Lee Beverage. 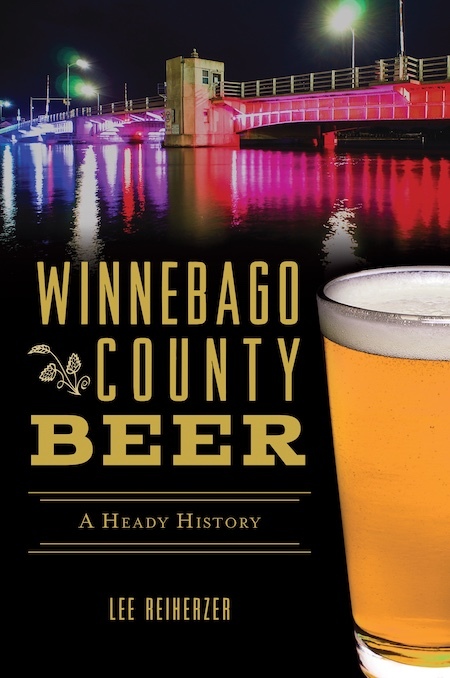 Instead of basing his business on higher-priced beers, he’d use budget beer to go head to head with Oshkosh's breweries – OBC and Peoples – which continued to control much of the local market. As the local distributor for G. Heileman Brewing of La Crosse, Lee Beverage had access to a number of low-price brands the brewery had acquired over the previous decade. Among them was Kingsbury. Despite almost no promotion, Kingsbury had been selling moderately well in Oshkosh since the mid-1950s. Shorty Kuenzl was well aware of the potential of the brand. In 1957, he had been involved in tracking the local impact of Kingsbury for OBC. He realized that his predecessor at Lee Beverage hadn’t used the beer to its full advantage. That immediately changed when the Kuenzl family took over the business. Lee Beverage began to heavily promote Kingsbury in Oshkosh. 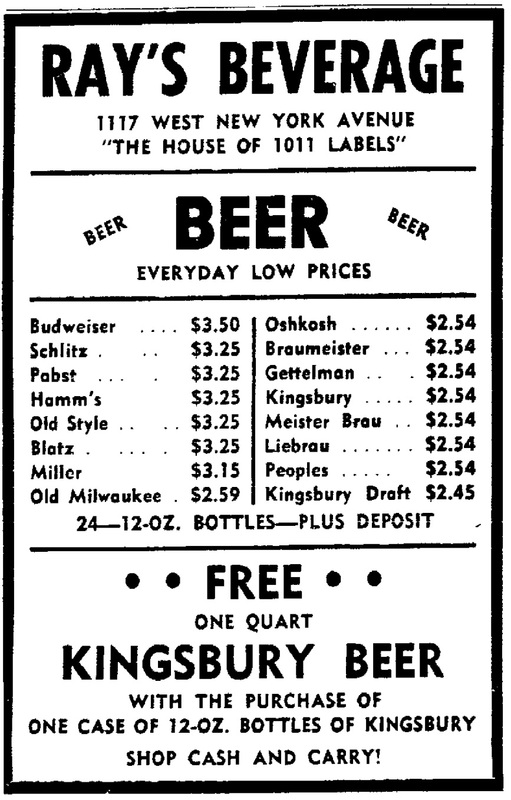 Ads for the beer appeared in the Oshkosh Daily Northwestern just days after Lee Beverage had been sold. Kingsbury was all about price. It was among the cheapest beers in Oshkosh. As further incentive, a case of Kingsbury was often offered with an additional free quart of beer. It was a tactic, OBC and Peoeples found impossible to compete with. Lee Beverage ramped-up quickly. The company outgrew its small warehouse on 6th Avenue. Shorty purchased three acres in the Oshkosh Industrial Park on Oregon Street where he had a new facility built to house the business. Lee Beverage was now a force to be reckoned with. But there was conflict at the heart of Shorty’s new endeavor. He still owned that 14% share of the Oshkosh Brewing Company. The success of Lee Beverage was chiseling away at the value of his OBC holdings. If Shorty was conflicted, he didn’t let it interfere with his work. He threw himself into building the beer distributorship. The entire Kuenzl family was with him. Shorty’s sons, Bud, who worked for OBC; and John, who had recently completed military service; both went to work for Lee Beverage. Kay Kuenzl-Stenerson, daughter of Bud Kuenzl, recalls how they all pitched in. Meanwhile OBC was tanking. 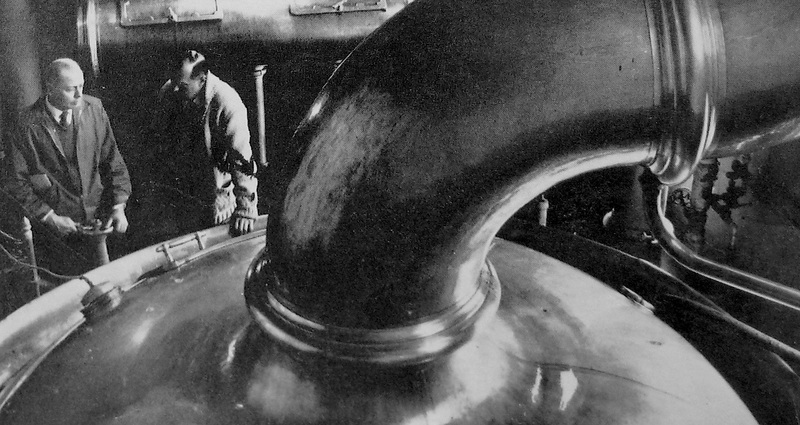 From 1964 onward, production at the brewery tumbled. Uihlein fought to stanch the bleeding. He went on an extended tour of local taverns trying to boost the declining sales of Chief Oshkosh Beer. It was to no avail. Lee Beverage’s ascent continued. OBC imploded. In 1971 the brewery closed. Later that decade, Lee Beverage purchased distributorships in Sheboygan and Eau Claire. It was the beginning of a series of acquisitions that would position the company as one of Wisconsin’s top beer distributors. That remains the case. Lee Beverage of Wisconsin continues to operate from its base in Oshkosh. For Shorty Kuenzl, the victory had to have been bittersweet. He was 63 years old when he aligned his family with Lee Beverage. In the latter stage of his life he found himself in the disorienting position of working against the brewery his ancestors had helped launch, a brewery he had dedicated much of his life to. 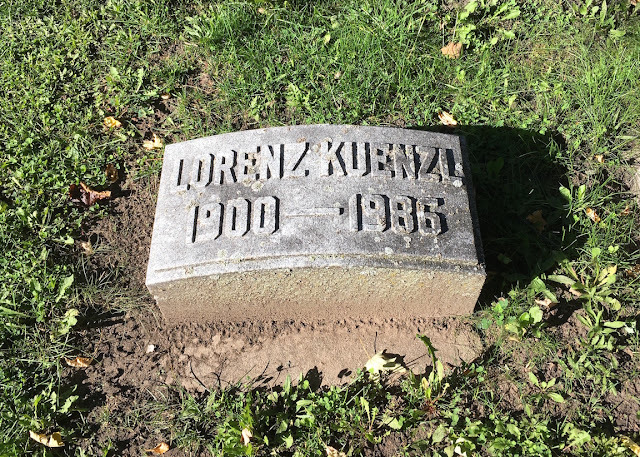 Lorenz “Shorty” Kuenzl died in 1986. He’s buried in Riverside Cemetery near his grandfather, Lorenz Kuenzl, a founder of the Oshkosh Brewing Company. Kay Kuenzl-Stenerson remembers her grandfather fondly. She paints a more complete picture of Shorty Kuenzl. The Cellar homebrew supply shop, which opened at the end of August in Oshkosh, will have its first brew session/class in Oshkosh this Saturday, October 8 at 11 a.m. The guest instructor will be Andrew Roth, assistant brewer at Pearl Street Brewery in La Crosse. The event is free, open to the public, and a great chance to check out the excellent homebrew shop that’s now calling Oshkosh home. The Cellar is located at 1921 S. Washburn St. See you there! In February 1961, David Uihlein was in negotiations to purchase controlling interest of the Oshkosh Brewing Company. 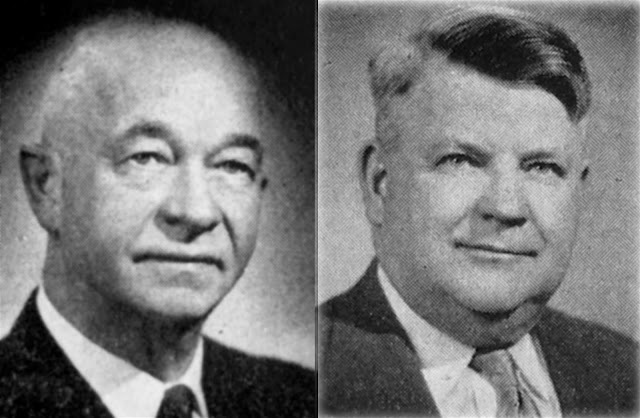 On the other side of the bargaining table were OBC’s president, Arthur Schwalm, and vice-president, Earl Horn. Horn and Schwalm were also the brewery’s principal shareholders. Their families had been engaged in brewing in Oshkosh for generations. That was about to end. Horn and Schwalm were ready to cash out. In June 1961, the sale hit a snag when 76-year-old Arthur Schwalm died unexpectedly. But by the end of summer a deal had been worked out. On August 16, 1961, came the announcement that David Uihlein was taking over the Oshkosh Brewing Company. The sale of OBC was front page news in Oshkosh. The story ran in newspapers across the state. A familiar refrain appeared in the reports: David Uihlein was fulfilling his dream, he had always wanted to own a medium-sized brewery. People in Oshkosh were skeptical. It didn’t add up. Uihlein was a member of the family that held controlling interest in the Jos. Schlitz Brewing Company. Schlitz was then the second largest brewery in the nation. Why would the heir to a dynasty meddle with a small brewery in Northeast Wisconsin? Was he acting in concert with Schlitz? Was Uihlein here to plunder Oshkosh’s largest brewery? Uihlein insisted that wasn’t the case. He may have even meant it. At that moment, Uihlein’s plan for OBC was crumbling around him. That plan wouldn’t be revealed for another 14 years. Bob Uihlein had some firm ideas about what needed to be done at Schlitz, and he indicated to directors that he wouldn’t tolerate too much family interference. To his dismay, he ran into a family problem at the first board meeting after he became president. A cousin, David V. Uihlein, who had earlier acquired a small brewery, wanted to sell it to Schlitz. Back in 1961, David Uihlein was telling a different story to people in Oshkosh. He was redirecting the narrative. He was talking about his dreams. But Uihlein was stuck. He had a brewery on his hands that he apparently didn’t want. What followed isn’t altogether surprising. Within six years of his arrival, the thriving brewery Uihlein had purchased was on the verge of collapse. To give Uihlein his due, he initially appeared to have done his best to maintain the prosperous brewery he had taken over. Perhaps he was still hoping to court a suitor. He invested in new equipment, initiated a new marketing campaign, and tried to expand the brewery’s distribution. It came to nothing. This was a man inherently unsuited for the leadership of a regional brewery. A series of blunders, including changing the recipe for Chief Oshkosh Beer, resulted in a constant erosion of beer sales beginning in 1964. 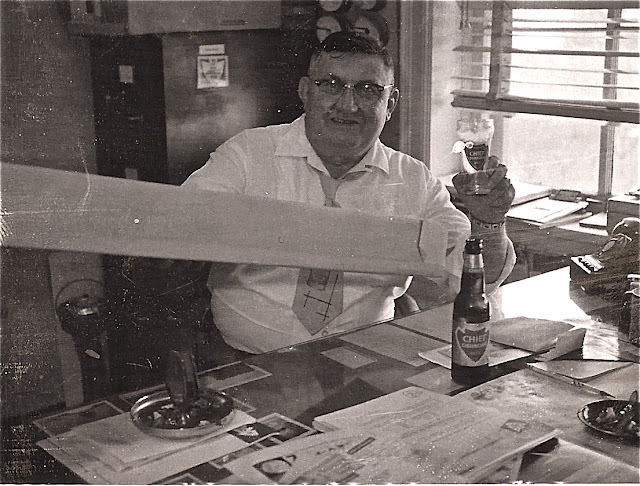 In 1960, the year before Uihlein became president of OBC, the brewery produced over 58,000 barrels of beer. In 1969, the year Uihlein sold the brewery, production had fallen by more than 40% to less than 34,000 barrels. Chief Oshkosh wasn’t the only Wisconsin brand of beer to wither under Uihlein’s hand. 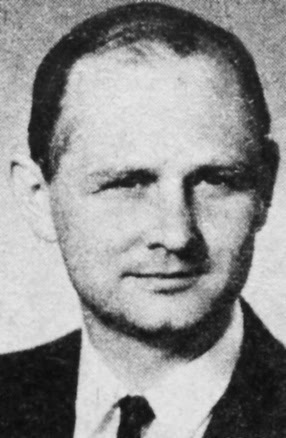 In 1966, he purchased the label rights for Rahr’s of Green Bay, Liebrau of Two Rivers Brewing, and Badger Brew of Effinger Brewing in Baraboo. The three Wisconsin breweries that brewed these beers had recently ceased operations. But in the year prior to their closing they had produced a combined total of more than 40,000 barrels of beer. The acquisition and production of these brands should have resulted in a significant increase in OBC’s output. The maneuver proved fruitless. Production and sales at OBC continued their steady decline. Two years after Uihlein left Oshkosh, OBC closed. Uihlein was back in Milwaukee then. There he joined the board of directors of Schlitz where he helped shepherd the most dramatic brewery failure in American history. One would assume that at that point David Uihlein stopped dreaming of breweries.